In a recent international study by Experian Hitwise, the leading online competitive intelligence service with the world’s largest sample of internet users, the home Internet usage of various individuals from eight different countries accessing Facebook during August 2011 has been revealed. Brazil, Singapore, US, India, New Zealand, France, Australia and the UK all have surprisingly different results. A better understanding of how social media is being used to engage various audiences across several demographics will give most marketers the upper hand when assessing how to run their next campaigns, or deciding where to focus the majority of their attention and money. Content and advertising which is compelling will ultimately lead to greater engagement in social networks and consequently greater sales, whether on the brand’s own website or indeed within Facebook. 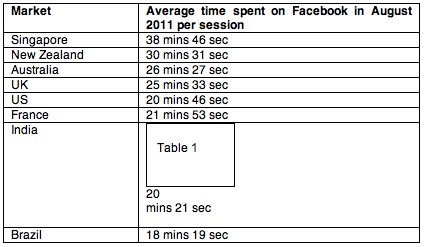 Interestingly enough, Singaporeans dominate Facebook usage, averaging upwards of 38 minutes and 46 seconds per session, while users in Brazil tend to spend half as much time at only 18 minutes and 19 seconds per session. Now, more than ever, is the time for brands to embrace social networking and, in this case, Facebook’s ability to engage an audience. By referring to the data above, brands can better assess what times their digital campaigns should be shown on the platform, and better target which audiences. In this way, a brand can better capture the attention of their target audience. Singaporeans, for example, who top the Facebook usage charts at 38 minutes might be more responsive to in-depth advertisements that fully engage them and draw them into whatever app, game, or discussion is going on around a brand. Brazilian users, on the other hand, who peters out at the lower end of the Facebook usage spectrum might benefit instead from hard-hitting and quick attention grabbing advertisements. 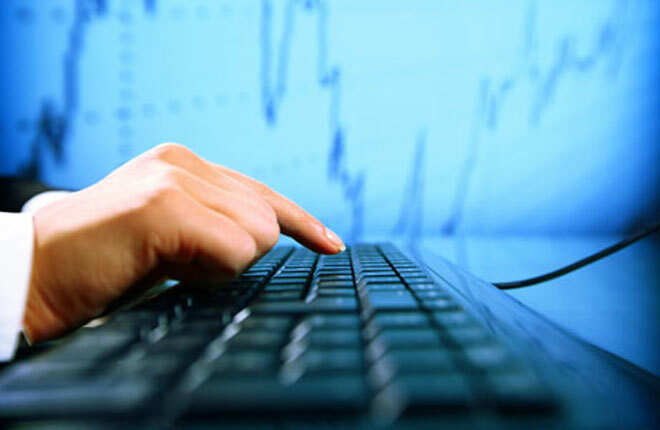 Different industries are already using this data to attract website traffic as a direct result of social network use. Consumers in Brazil, India, and Singapore for example are more likely to visit retail websites after visiting social networking sites that highlight their stores, thus presenting an opportunity to retailers to drive web traffic and sales through social networks. In New Zealand, however, only 9% of retailers receive web traffic from social media, again pinpointing an area for growth or improvement. 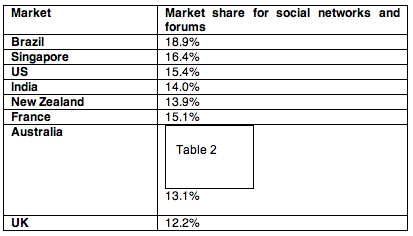 Social networks dominate Internet usage. According to Experian, social networking is now one of the most popular online pastimes across the globe. Thousands of social networks populate each country, while only a few might rise to the top. By understanding social network vital signs and discovering which areas of the world have the most heavy usage, while keeping an eye on emerging markets, advertisers and brands can better reach different audiences across the world. For more data, see the charts below.